Large bone defects may occur due to either traumatic or non-traumatic causes, e.g. post tumor excision. One way to manage such cases is with reconstructive surgery, which requires bone grafting procedure to fill the defect. To fill in the defect, bone sources could come from autograft, allograft, xenograft and Allograft Prosthesis Composite (APC) [1Suroto H, Munthe RV. Chip freeze dried cancellous bone allograft as scaffold to fill small bone defect in long bone. J Orthop Traumatol Surabaya 2014; 3(1): 192-201.-3Nieminen J, Pakarinen TK, Laitinen M. Orthopaedic reconstruction of complex pelvic bone defects. Evaluation of various treatment methods. Scand J Surg 2013; 102(1): 36-41. [http://dx.doi.org/10.1177/145749691310200108] [PMID: 23628635] ]. Allografts are most often used as an alternative to autograft [4Delloye C, Cornu O, Druez V, Barbier O. Bone allografts: What they can offer and what they cannot. J Bone Joint Surg Br 2007; 89(5): 574-9. [http://dx.doi.org/10.1302/0301-620X.89B5.19039] [PMID: 17540738] ]. They have several advantages over autograft, which reduce the operating site morbidity, bleeding and more bone availability. Fresh frozen allograft is a type of allograft that is often used for reconstructive surgery for large bone defects due to its similar biomechanical strength with normal bone, low immunogenicity and it allows for adjustments based on the defect size [5Shukla S, Malhotra R, Bhan S. Results of fresh frozen bone allografts in orthopaedics. Indian J Orthop 2003; 37(2): 8., 6Ferdiansyah , et al. Regenerasi pada massive bone defect dengan bovine hydroxyapatite sebagai Scaffold Mesenchymal Stem Cell. JBP 2011; 13(3): 179-95.]. Fresh frozen allograft also has osteoinductive properties because it contains Bone Morphogenetic Proteins (BMPs) and Vascular Endothelial Growth Factor (VEGF) in a matrix that is not calcified, albeit in small amounts [7Rodella LF, Favero G, Boninsegna R, Borgonovo A, Rezzani R, Santoro F. TGF-beta1 and VEGF after fresh frozen bone allograft insertion in oral-maxillo-facial surgery. Histol Histopathol 2010; 25(4): 463-71. [PMID: 20183799] ]. However, few complications exist with the use of allograft, including nonunion (12-57%), fracture (17-30%) and infection (10-15%) [8Ogura K, Miyamoto S, Sakuraba M, Fujiwara T, Chuman H, Kawai A. Intercalary reconstruction after wide resection of malignant bone tumors of the lower extremity using a composite graft with a devitalized autograft and a vascularized fibula. Sarcoma 2015; 2015(861575): 861575. [PMID: 25784833] ]. To reduce such complications, a novel method in bone tissue engineering is proposed using a combination of allograft and growth factor, which in hope will stimulate the formation of bridging callus. PDGF is one of the growth factors that until now has not been adequately researched on its possible role as an allograft incorporation, especially fresh frozen allograft. Some considered PDGF as a “starter” for the wound healing process in tissue regeneration, offering great results on both soft and hard tissue regeneration [14Bordei P. Locally applied platelet-derived growth factor accelerates fracture healing. J Bone Joint Surg Br 2011; 93(12): 1653-9. [http://dx.doi.org/10.1302/0301-620X.93B12.27244] [PMID: 22161929] , 15Tahriri M, Rasoulianboroujeni M, Bader R, Vashaee D, Tayebi L. Growth factors for oral and maxillofacial regeneration applications 2017; 205-19. [http://dx.doi.org/10.1016/B978-0-08-100961-1.00013-X] ]. Nevins et al. showed that recombinant human Platelet Derived Growth Factor (rhPDGF) in combination with bone allograft showed very good result in the regeneration of periodontal defect [16Nevins M, Camelo M, Nevins ML, Schenk RK, Lynch SE. Periodontal regeneration in humans using recombinant human platelet-derived growth factor-BB (rhPDGF-BB) and allogenic bone. J Periodontol 2003; 74(9): 1282-92. [http://dx.doi.org/10.1902/jop.2003.74.9.1282] [PMID: 14584860] ]. The administration of recombinant human Platelet Derived Growth Factor (rhPDGF BB) also shown to increase bone density and biomechanical strength on osteoporotic bone in rats [12Hollinger JO, Hart CE, Hirsch SN, Lynch S, Friedlaender GE. Recombinant human platelet-derived growth factor: biology and clinical applications. J Bone Joint Surg Am 2008; 90(Suppl. 1): 48-54. [http://dx.doi.org/10.2106/JBJS.G.01231] [PMID: 18292357] , 17Chen W, Baylink DJ, Brier-Jones J, et al. PDGFB-based stem cell gene therapy increases bone strength in the mouse. Proc Natl Acad Sci USA 2015; 112(29): E3893-900. [http://dx.doi.org/10.1073/pnas.1501759112] [PMID: 26150503] ]. To date, no evidence has shown if the administration of PDGF on fresh frozen allograft for large bone defect on femoral bone in rats may improve bone healing, marked by formation of bridging callus through the higher expression of VEGF, BMP-2 and osteocalcin. This study aimed to determine whether the administration of recombinant rat PDGF BB (rrPDGF BB) may improve the bone healing process and to determine its effect on the formation of bridging callus, expression of VEGF, BMP-2 and osteocalcin in fresh frozen allograft post reconstructive surgery of large bone defect on femoral rat bone. This study was approved on October 11, 2016, by the research Ethics Committee of the Medical Faculty of the Udayana University / Sanglah General Hospital Denpasar, which studied and stated that this study had been declared ethically feasible with protocol number 980.03.1.2016 and would be valid for 1 year from its validation. This was a study with post-test only control group design, aimed to determine whether the addition of rrPDGF BB may increase the level of VEGF, BMP-2 and osteocalcin post reconstructive surgery of large bone defect with fresh frozen allograft on femoral rat bone. A total of 32 wistar rats were involved in this study. The inclusion criteria were healthy male rat aged 12 weeks old with the weight of 200-250 grams and active movement, while unhealthy rats (inactive movements) refused to eat during the study were excluded. All samples randomly divided equally into two groups: 16 rats in the treatment group with the administration of rrPDGF BB and 16 rats in the control group, and all equipments used in the research were standardized before use to minimize the effect of subjective bias. The treatment group underwent surgery for creating 5 mm of defect on the right femoral bone and received fresh frozen allograft with the addition of 100 µL rrPDGF-BB with concentration of 40 ng/ml concentration. The control group underwent surgery for creating 5 mm of defect on the right femoral bone and received fresh frozen allograft without the addition of rrPDGF-BB. Internal fixation with K-wire 1.2 was used in both groups after the procedure. All samples received topical neomycin and cefotaxime injection for three days. After four weeks, all subjects were terminated with barbiturate. The proximal, middle and distal part of the allograft were obtained for measurement of VEGF, BMP-2 and osteocalcin. The subjects of this study were male Wistar rats, aged 12-weeks with body weight of 200-250 gram. The total number of subjects was 32, divided equally into 2 groups: 16 rats in treatment group with the administration of rrPDGF BB and 16 rats in the control group. During the growing period each of 4 wistar rats were put together in a cage with floors and walls made of plastic with thin wires at the top measuring approximately 1,500 cm2 wide with 20-22 cm high, bedding as high as 1.5-2 cm, adding wool in the top of bedding base, and administrated fresh vegetable every day. Wistar rats which had fulfilled the inclusion criteria were separated from the adjacent cages for approximately 24 hours before being put together in each group (control and treatment). Determination of the wistar rats that will be grouped into control groups and treatment groups were using simple randomization technique and numbering in rats. Then the drawing is done using flip coins, the results of the head draw will be placed in the control group, otherwise, the results in the form of tails become the treatment group. The study conducted in Animal laboratory of Veterinary Laboratorium Department that was in accordance with the standard and suitable to be used as a study location established by the Ethics Committee of Udayana University / Sanglah General Hospital Denpasar from August to December 2016. The rat recombinant PDGF BB (rrPDGF-BB) from E. coli derived Ser74Thr182 with Accession #Q05028.1 was used in this study. The expression of VEGF, BMP-2 and osteocalcin were measured with immunohistochemistry. For each graft, the samples were collected from three different sites i.e. proximal, middle and distal. On each site, five locations were randomly selected for determination according to immunohistochemistry. The change in color of the cells from red to brown means positive for VEGF or osteocalcin expression. The total number of cells which underwent the change in color from those five locations were then calculated to obtain absolute value from each site (Figs. 2 , and 3 ). The measurement of anti-BMP-2 antibody was performed with a scoring method in five different locations of each site (proximal, middle and distal). The score was classified into 0 (no expression of anti-BMP-2 antibody found on the callus of femoral bone), 1 (the presence of anti-BMP-2 antibody on the callus of femoral bone), 2 (expression of anti-BMP-2 antibody found on the callus of femoral bone with mild intensity), 3 (expression of anti-BMP-2 antibody found on the callus of femoral bone with moderate intensity), 4 (expression of anti-BMP-2 antibody found on the callus of femoral bone with high intensity). 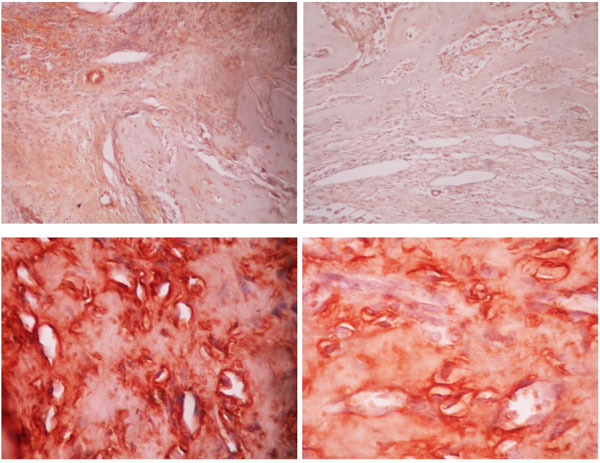 Analysis of bridging callus, as the formation of new bone trabecula, was performed in proximal, middle and distal part of allograft with hematoxylin and eosin staining. The collected data analyzed with statistical SPSS program for Windows version 22.0. The VEGF, BMP-2 and osteocalcin data were not distributed normally and a non-parametric statistical test was used. VEGF and osteocalcin was the ratio data and was calculated using Mann-Whitney U Test, while BMP2 and bridging callus were ordinal or categorical data and calculated using Chi Square test. A Path analysis was performed to identify the effect of rrPDGF BB administration towards VEGF, BMP-2 and osteocalcin. The subjects of this study were male Wistar rats, aged 12-weeks with a body weight of 200-250 gram. The total number of subjects were 32, divided equally into 2 groups: 16 rats in treatment group with the administration of rrPDGF BB and 16 rats in control group with simple randomization in grouping the rats. The allograft VEGF expression median value in the treatment group was 9.00 (interquartile range 0.38), while in the control group the median value was 5.00 (interquartile range 2.75). The result showed VEGF expression in the treatment group was significantly higher compared to the control group (p < 0.001, Table 1). Comparative test result on VEGF expression of treatment and control group using Mann-Whitney U. At different sites of allograft, VEGF expression in proximal and distal allograft of rrPDGF BB group showed significantly higher expression compared to control group (p < 0.001 for both sites, Table 1). Both the treatment and control groups showed BMP-2 expression, however, in the treatment group the BMP-2 expression tend to have high and moderate intensity while the control group only showed medium and mild intensity of expression (p = 0.001, Table 2). Comparative test result on BMP 2 expression of treatment and control group using Chi Square. The BMP-2 expression on proximal allograft showed high expression in 56.2% of treatment group, while the majority of the control group (75%) showed a moderate expression. The middle part of allograft showed a high BMP-2 expression in 31.3% of the treatment group, while 100% of the control group showed mild expression. The distal part of allograft showed a high BMP-2 expression in 56.2% of the treatment group, while 62.5% of the control group showed moderate expression. The chi square result showed a significant difference in the expression of BMP-2 on different parts of allograft (proximal, middle and distal) between the treatment and the control groups (p = 0.005, p = 0.002 and p = 0.001 for proximal, middle and distal part, respectively) (Table 2). Median expression of osteocalcin on the allograft belonging to the treatment group was 28.00 (interquartile range 8.75) while those in the control group showed a median value of 15.00 (interquartile range 2.00). The treatment group showed a higher expression than the control group (p < 0.001, Table 3). Comparative test result on osteocalcin expression of treatment and control group using Mann-Whitney U. The expression of osteocalcin in the group treated with rrPDGF BB was higher compared to control group either in proximal, middle or distal part of allograft (p < 0.001, p = 0.002, and p < 0.001, respectively). In the treatment group, 43.8% of samples showed a formation of bridging callus on the allograft while in the control group, no bridging callus was found (p = 0.003, Table 4). The formation of bridging callus in the treatment group was higher compared to control group either in proximal (87.5% vs 81.3%), middle (50% vs 0%) or distal (93.8% vs 6.3%) part of allograft. However, only the middle part showed a significant difference (p = 0.001). Comparative test result on bridging callus formation in the treatment and control group using Chi Square. To identify the relationship between the variables stated above, a path analysis was done and shown in Fig. (1 ). Path analysis showed a positive relationship between PDGF intervention and VEGF expression resulting in an increased expression of VEGF of 73.5% (p < 0.001; CI 0.599-0.871). A positive relationship has been observed between PDGF intervention and BMP-2 expression, in which it also increases the expression of BMP-2 of 70.4% (p < 0.001; CI 0.417-0.991). PDGF intervention also increases the expression of osteocalcin for 71.5% (p < 0.001; CI 0.570-0.861). VEGF expression on this analysis showed a strong relationship with BMP-2 expression, where VEGF is expected to increase the expression of BMP-2 with a value of 34% (p = 0.021; CI 0.051-0.629). The increase in BMP-2 expression resulted in an increase in bridging callus (44.2%) with p = 0.014 (CI 0.087-0.798), while osteocalcin level showed an increase of 56.3% (p < 0.001; CI 0.255-0.872) (Table 5). Path analysis with fitting target model. 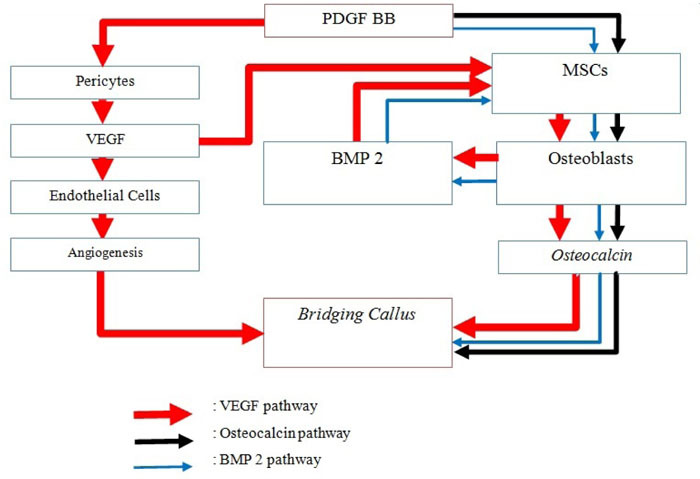 Formation of bridging callus after administration of platelet derived growth factor (PDGF) on allograft occur through 3 pathways: The formation of Vascular Endothelial Growth Factor (VEGF), bone morphogenetic protein-2 (BMP-2) and osteocalcin. The resulting path analysis showed a formation of bridging callus after administration of PDGF on allograft which occurs through 3 pathways: the formation of VEGF, BMP-2 and osteocalcin. From the three paths, VEGF holds the most important role. Platelet Derived Growth Factor (PDGF) is a group of protein, consisting of PDGF-AA, PDGF-AB, PDGF-BB, PDGF-CC, PDGF-DD, and the PDGF-AB heterodimer that is produced by platelet. This growth factor family plays an essential role in embryonic development and in wound healing in adults [9Roskoski R Jr. The role of small molecule Platelet-Derived Growth Factor Receptor (PDGFR) inhibitors in the treatment of neoplastic disorders. Pharmacol Res 2018; 129: 65-83. [http://dx.doi.org/10.1016/j.phrs.2018.01.021] [PMID: 29408302] ]. PDGF- BB is chemotactic and mitogenic for osteoblasts, so it can function as a factor that can improve healing fractures by pulling osteoprogenitor cells to the fracture site and increasing the number of mitogenesis. In addition, PDGF-BB is proangiogenic, which up-regulates VEGF to stimulate the growth of new capillary blood vessels. PDGF also increases VEGF expression which is a key molecule in the process of bone regeneration [10Shrivats AR, McDermott MC, Hollinger JO. Bone tissue engineering: state of the union. Drug Discov Today 2014; 19(6): 781-6. [http://dx.doi.org/10.1016/j.drudis.2014.04.010] [PMID: 24768619] -13Drela E, Kulwas A, Jundziłł W, et al. VEGF-A and PDGF-BB-angiogenic factors and the stage of diabetic foot syndrome advancement. Endokrynol Pol 2014; 65(4): 306-12. [http://dx.doi.org/10.5603/EP.2014.0042] [PMID: 25185854] ]. The PDGF also stimulates the proliferation of mesenchymal cells to osteoblasts that participate in new bone formation. Mature osteoblastic cells that were formed will release Bone Morphogenetic Protein-2 (BMP-2) and consecutively stimulate mesenchymal cell differentiation into osteoblastic cells. The formed osteoblasts also produced osteocalcin that participates in bone mineralization and as a chemoattractant for monocytes, mesenchymal cells as well as osteoclasts. This is proven with the discovery of high level of osteocalcin in highly mineralized bone [18Scarfì S. Use of bone morphogenetic proteins in mesenchymal stem cell stimulation of cartilage and bone repair. World J Stem Cells 2016; 8(1): 1-12. [http://dx.doi.org/10.4252/wjsc.v8.i1.1] [PMID: 26839636] , 19Patti A, Gennari L, Merlotti D, Dotta F, Nuti R. Endocrine actions of osteocalcin. Int J Endocrinol 2013; 2013: 846480. [http://dx.doi.org/10.1155/2013/846480] [PMID: 23737779] ]. In this study, there is a significant difference in the formation of bridging callus at the middle femoral bone in the treatment group given rrPDGF-BB compared to the control. Whereas the bridging callus formed in proximal and distal the femoral bone for the treatment group given rrPDGF-BB was not significantly different compared to the control. This shows that rrPDGF-BB can help bridging callus formation in proximal and distal defects, and even the formation of this callus bridged significantly to the middle part of the femur. This callus formation to the middle part of the femur might occur because of the administration of rrPDGF-BB, which increases VEGF expression and stimulate the formation of new vascularization to the intracortical. This is also followed by an increase in BMP-2 expression and osteocalcin to the central part of the femur, resulting in increased osteoblast cell migration and bone matrix formation needed for bridging callus and initiation of bone healing and remodeling processes [20Sanchez-Fernandez MA, Gallois A, Riedl T, Jurdic P, Hoflack B. Osteoclasts control osteoblast chemotaxis via PDGF-BB/PDGF receptor beta signaling. Heisenberg C-P, ed. PLoS ONE. 2008;3(10):e3537.]. This result shows similarity with a prospective study by Di Giovanni et al which showed an increase in osseous bridging formation in the ankle arthrodesis using an autograft after augmentation with rrPDGF-BB / β-TCP (p = 0.008). PDGF therefore has an important role in the process of bone formation. PDGF-BB stimulates VEGF secretion as an important mediator during the ossification process because of its ability to form new vascularization into bone tissue [21Digiovanni CW, Baumhauer J, Lin SS, et al. Prospective, randomized, multi-center feasibility trial of rhPDGF-BB versus autologous bone graft in a foot and ankle fusion model. Foot Ankle Int 2011; 32(4): 344-54. [http://dx.doi.org/10.3113/FAI.2011.0344] [PMID: 21733435] ]. The formed vascularization will help the differentiation of mesenchymal cells into osteoblasts, which play a vital role in the process of osteogenesis. Increased osteoblast cell formation stimulates the formation of a new bone matrix that increases callus bridging in the process of bone healing [22Luvizuto ER, Tangl S, Dobsak T, et al. Effect of recombinant PDGF-BB on bone formation in the presence of β-tricalcium phosphate and bovine bone mineral matrix: a pilot study in rat calvarial defects. BMC Oral Health 2016; 16(1): 52. [http://dx.doi.org/10.1186/s12903-016-0210-3] [PMID: 27145819] ]. The results of this study are not in accordance with the study conducted by Luvizuto et al which suggested that the administration of PDGF-BB did not have a significant effect on new bone formation on rat calvary bone defects given β-Tricalcium Phosphate (TCP) or Demineralized Bovine Bone Minerals (DBBM) [23Magnusson PU, Looman C, Ahgren A, Wu Y, Claesson-Welsh L, Heuchel RL. Platelet-derived growth factor receptor-beta constitutive activity promotes angiogenesis in vivo and in vitro. Arterioscler Thromb Vasc Biol 2007; 27(10): 2142-9. [http://dx.doi.org/10.1161/01.ATV.0000282198.60701.94] [PMID: 17656670] ]. This might be explained because of difference in bone sample, in which the thin calvaria bone they used has a low osteogenic capacity compared to the femoral bone of the mouse used in this study. At bone and connective tissue, PDGF is the most active in its homodimer (PDGF-BB). Grafting accompanied by augmentation of PDGF-BB can promote healing on the surface of the bone, especially those who experience complications such as non-union. PDGF stimulates tissue repair by increasing vascular growth and migration of bone growth cells without changing the cellular phenotype needed in the process of bone healing and remodeling [20Sanchez-Fernandez MA, Gallois A, Riedl T, Jurdic P, Hoflack B. Osteoclasts control osteoblast chemotaxis via PDGF-BB/PDGF receptor beta signaling. Heisenberg C-P, ed. PLoS ONE. 2008;3(10):e3537., 21Digiovanni CW, Baumhauer J, Lin SS, et al. Prospective, randomized, multi-center feasibility trial of rhPDGF-BB versus autologous bone graft in a foot and ankle fusion model. Foot Ankle Int 2011; 32(4): 344-54. [http://dx.doi.org/10.3113/FAI.2011.0344] [PMID: 21733435] ]. In this study, there were also statistically significant difference of VEGF expression in the treatment group compared to controls, where the expression of VEGF levels in the femoral bone of mice at proximal and distal parts of the treatment group given rrPDGF-BB was higher than the control. This shows that rrPDGF-BB can help increase vascularization in the proximal and distal femur after reconstructive surgery of large bone defects, so that it can help the bone union process with allograft. These results are consistent with studies by Magnusson et al. where it was reported that increased PDGFR-β kinase activity was associated with increased expression of VEGF-A and VEGF-2 receptors, which directly acted on endothelial cells and increased blood vessel formation, as well as role as neutralizing antibodies to VEGF-A / VEGF-2 receptors which inhibit vasculogenesis and angiogenesis processes at in vitro studies of mouse embryogenesis [23Magnusson PU, Looman C, Ahgren A, Wu Y, Claesson-Welsh L, Heuchel RL. Platelet-derived growth factor receptor-beta constitutive activity promotes angiogenesis in vivo and in vitro. Arterioscler Thromb Vasc Biol 2007; 27(10): 2142-9. [http://dx.doi.org/10.1161/01.ATV.0000282198.60701.94] [PMID: 17656670] ]. Similar findings were also reported by Raica M and Cimpean AM that PDGF not only stimulates endothelial cell proliferation but also plays a role in VEGF secretion [24Raica M, Cimpean AM. Platelet-Derived growth factor (PDGF)/PDGF receptors (PDGFR) axis as target for antitumor and antiangiogenic therapy. Pharmaceuticals (Basel) 2010; 3(3): 572-99. [http://dx.doi.org/10.3390/ph3030572] [PMID: 27713269] ]. Hollinger et al in his study explained the acceleration of fracture healing in geriatric and osteoporotic mouse models by administering Recombinant Human Platelet-Derived Growth Factor-BB (rhPDGF-BB) and the injection of beta-tricalcium phosphate / collagen matrix. It was further explained that PDGF is a potent and mitogen chemoattractant for mesenchymal cells (including osteogenic cells) which promotes angiogenesis and increases VEGF regulation resulting in increased vascularity [12Hollinger JO, Hart CE, Hirsch SN, Lynch S, Friedlaender GE. Recombinant human platelet-derived growth factor: biology and clinical applications. J Bone Joint Surg Am 2008; 90(Suppl. 1): 48-54. [http://dx.doi.org/10.2106/JBJS.G.01231] [PMID: 18292357] ]. Di Giovanni et al. also suggested things that are in line with the results of this study, where rhPDGF-BB is an osteostimulator protein that has strong mitogenic and chemotactic effects on mesenchymal cells and has pro-angiogenic properties via VEGF regulation which plays an important role in bone healing cascade. In addition, rhPDGF-BB mobilizes mesenchymal stem cells (pericytes) which contribute to population of regenerative cells and help stabilize the newly formed blood vessels [21Digiovanni CW, Baumhauer J, Lin SS, et al. Prospective, randomized, multi-center feasibility trial of rhPDGF-BB versus autologous bone graft in a foot and ankle fusion model. Foot Ankle Int 2011; 32(4): 344-54. [http://dx.doi.org/10.3113/FAI.2011.0344] [PMID: 21733435] ]. PDGF is known as one of the major factors that play a role in the formation of intimal lesion and vascular remodeling. One of the advantages of PDGF is that it induces arterial smooth muscle cells to migrate and proliferate. PDGF plays an important role in the process of bone formation, erythropoeysis, wound healing, and angiogenesis. In the process of angiogenesis, PDGF-BB stimulates secretion from VEGF in the pericyte part, thus bringing endothelial cells to angiogenesis in the damaged location. Then PDGF-BB carries PDGFR-b expressing MSC/pericytes again to make contact with microveins that undergo enlargement and infiltration, while also stabilize blood vessel position and formation [25Caplan AI, Correa D. PDGF in bone formation and regeneration: new insights into a novel mechanism involving MSCs. J Orthop Res 2011; 29(12): 1795-803. [http://dx.doi.org/10.1002/jor.21462] [PMID: 21618276] ]. VEGF is proven to function as an important mediator during the ossification process because of its ability to form new blood vessels into hypertrophic cartilage and mediated by CBFA-1 / Runx-2. The formed blood vessel helps mesenchymal cells differentiate into osteoblast cells and is involved in the process of osteogenesis. VEGF plays a role in various aspects of osteoblast function through dose-dependent chemoattractive effects of VEGF on primary osteoblasts and mesenchymal progenitor cells, stimulates osteoblast cell proliferation by up to 70% and promotes primary osteoblast differentiation in vitro by increasing dose-dependent alkaline phosphatase activity. In addition, VEGF is also involved in the recruitment of osteoclasts, differentiation and increased bone absorption activity by osteoclasts in adult rabbits [26Yang YQ, Tan YY, Wong R, Wenden A, Zhang LK, Rabie AB. The role of vascular endothelial growth factor in ossification. Int J Oral Sci 2012; 4(2): 64-8. [http://dx.doi.org/10.1038/ijos.2012.33] [PMID: 22722639] ]. Although the bridging callus was formed up to the middle part of the femur, but in this study, VEGF expression was not found with immunohistochemical examination in that part. According to Pazzaglia et al., this can be explained because the organizational structure of the cortex in the diaphysis is a longitudinal canal system (Haversian system) which is connected to the transversal canal (Volkmann's canals) in which there are intracortical fine blood vessels that contribute to the circulation of the bone cortex, with a smaller shape and size compared to trabecular bone in proximal and distal [27Pazzaglia UE, Bonaspetti G, Ranchetti F, Bettinsoli P. A model of the intracortical vascular system of long bones and of its organization: an experimental study in rabbit femur and tibia. J Anat 2008; 213(2): 183-93. [http://dx.doi.org/10.1111/j.1469-7580.2008.00932.x] [PMID: 19172733] ]. Cortical bone is a hard tissue with a calcified matrix so that it is currently difficult to investigate the circulation of intracortical vascular tissue. Technically, this blood vessel network is incorporated in the hard cortical bone mass so that decalcification is needed to be able to use standard histology methods [28Clarke B. Normal bone anatomy and physiology. Clin J Am Soc Nephrol 2008; 3(Suppl. 3): S131-9. [http://dx.doi.org/10.2215/CJN.04151206] [PMID: 18988698] ]. In addition, the injection procedure for smooth intracortical vascular perfusion can only be done with a low viscosity solution. Some procedures such as three-dimensional morphometry in an electron microscope or with a full depth of field of light microscopy at the full-thickness hemicortex at 100 times magnification may help visualize intracortical vascular tissue. The foregoing problems cause VEGF, as an indicator of vascularization formation, was not expressed in standard immunohistological staining at the middle femur samples. But the significant presence of BMP-2 expression and osteocalcin in that area indicates bone formation and mineralization which indirectly proves the formation vascularization which reaches the middle femur in the form of intracortical vascularization. This intracortical vascularization allows transportation of substances such as BMP-2 and osteocalcin to the middle femur to initiate bone formation and mineralization in the form of significant callus formation. The relationship between theoretical framework with path analysis. In this study, there is statistically significant higher expression of BMP-2 level at proximal, middle and distal femur after extensive surgical reconstruction of broad bone defects using fresh frozen allograft with rrPDGF-BB compared to controls. This shows that the administration of rrPDGF-BB has been shown to be effective, given the high BMP-2 expression at proximal, middle and distal femur, so that it can stimulate the union process in allografts. This was a similar finding with research by Singhatanadgit et al. who found the effects of TGF-β1, FGF-2, and PDGF were significantly increasing BMPR-IB mRNA expression, so as to improve osteoblast function mediated by increased BMP-2 expression. PDGF plays an important role in the process of osteogenesis through modulation of the BMP/BMPR pathway by increasing regulation of BMP Receptor expression (BMPR), resulting in osteogenic bone cell responses [29Singhatanadgit W, Salih V, Olsen I. Bone morphogenetic protein receptors and bone morphogenetic protein signaling are controlled by tumor necrosis factor-alpha in human bone cells. Int J Biochem Cell Biol 2006; 38(10): 1794-807. [http://dx.doi.org/10.1016/j.biocel.2006.05.005] [PMID: 16797218] ]. A. Bridging Callus at control group B. Bridging Callus at treatment group. PDGF is a growth factor that is responsible for bone reparative processes. PDGF plays a role in modulating osteogenic responses involving factors, such as BMP, which serve to differentiate mesenchymal cells from osteoblast cells [40Caplan AI, Correa D. PDGF in bone formation and regeneration: new insights into a novel mechanism involving MSCs. J Orthop Res 2011; 29(12): 1795-803. [http://dx.doi.org/10.1002/jor.21462] [PMID: 21618276] ]. PDGF activates osteogenic cells through chemotactic and mitogenic processes by increasing differentiation of osteoblast and chondrocyte cells through BMP, hedgehog proteins, and activation of Wnt-signaling pathway. BMP is known to help the production of bone matrix and vascularization by binding to mesenchymal cell receptors, which then send signals through specific proteins that activate and induce mesenchymal cells to differentiate into osteoblasts or chondrocytes [30Dorman LJ, Tucci M, Benghuzzi H. In vitro effects of bmp-2, bmp-7, and bmp-13 on proliferation and differentation of mouse mesenchymal stem cells. Biomed Sci Instrum 2012; 48: 81-7. [PMID: 22846268] ]. Di Giovanni et al suggested that BMP-2 is osteoinductive which can regulate bone formation cascades. In addition, BMP-2 has chemotactic properties against human monocytes and stimulates the expression of TGF-β1 cytokine angiogenesis [21Digiovanni CW, Baumhauer J, Lin SS, et al. Prospective, randomized, multi-center feasibility trial of rhPDGF-BB versus autologous bone graft in a foot and ankle fusion model. Foot Ankle Int 2011; 32(4): 344-54. [http://dx.doi.org/10.3113/FAI.2011.0344] [PMID: 21733435] ]. Circulating monocytes leave the bloodstream and enter the tissue, where differentiation will occur into macrophages, which will secrete cytokines and stimulate VEGF to cause the process of angiogenesis [31Raida M, Clement JH, Leek RD, et al. Bone Morphogenetic Protein 2 (BMP-2) and induction of tumor angiogenesis. J Cancer Res Clin Oncol 2005; 131(11): 741-50. [http://dx.doi.org/10.1007/s00432-005-0024-1] [PMID: 16136355] ]. Garrison et al reported that BMP in nonunion fracture is useful to stimulate bone healing, whereas in acute fractures, BMP could be used to accelerate fracture healing [32Garrison KR, Shemilt I, Donell S, et al. Bone Morphogenetic Protein (BMP) for fracture healing in adults. Cochrane Database Syst Rev 2010; (6): CD006950. [PMID: 20556771] ]. Faßbender et al also reported that BMP-2 is more effective for stimulating bone healing. Cascade of BMP-2 signals begins at the initial phase of bone healing, triggering an inflammatory response and periosteal activation. Some BMPs like BMP-2, BMP-4 and BMP-7 are osteoinductive. BMP-2 has also been shown to be a very important gene involved in osteoporosis and bone metabolism [33Faßbender M, Minkwitz S, Strobel C, Schmidmaier G, Wildemann B. Stimulation of bone healing by sustained bone morphogenetic protein 2 (BMP-2) delivery. Int J Mol Sci 2014; 15(5): 8539-52. [http://dx.doi.org/10.3390/ijms15058539] [PMID: 24830556] ]. In this study, there was a statistically significant difference between the expression of osteocalcin levels at proximal, middle and distal femur with rrPDGF-BB treatment after extensive surgical reconstruction of bone defects using fresh frozen allograft, compared with the control. This shows that the administration of rrPDGF-BB is effective for increasing osteocalcin expression at proximal, middle and distal femur compared to controls so that it can stimulate the union process in allografts. This is similar with the research by Abreu et al which showed that there was a significant increase of VEGF expression and osteocalcin after PDGF-BB was given in alveolar bone of rat. VEGF expression causes an increase in the formation of new endothelial cells at the site of injury resulting in the formation of new blood vessels, while the expression of osteocalcin causes increased function of osteoblasts and bone mineralization [34Abreu FA, Ferreira CL, Silva GA, et al. Effect of PDGF-BB, IGF-I growth factors and their combination carried by liposomes in tooth socket healing. Braz Dent J 2013; 24(4): 299-307. [http://dx.doi.org/10.1590/0103-6440201302238] [PMID: 24173245] ]. It is different with earlier research by Canalis et al who suggested that PDGF and TGF beta did not have a significant effect on the synthesis of osteocalcin, only IGF-I and FGF could stimulate the synthesis of osteocalcin that contributes to bone mineralization, not bone formation [35Canalis E, McCarthy TL, Centrella M. The role of growth factors in skeletal remodeling. Endocrinol Metab Clin North Am 1989; 18(4): 903-18. [http://dx.doi.org/10.1016/S0889-8529(18)30348-7] [PMID: 2691242] ]. Another study by Wildemann et al also stated that PDGF-BB and IGF-I did not have a significant effect on alkaline phosphatase activity, type 1 collagen synthesis and levels of osteocalcin on mesenchymal cell line C2C12 experimental medium [36Wildemann B, Burkhardt N, Luebberstedt M, Vordemvenne T, Schmidmaier G. Proliferating and differentiating effects of three different growth factors on pluripotent mesenchymal cells and osteoblast like cells. J Orthop Surg Res 2007; 2: 27. [http://dx.doi.org/10.1186/1749-799X-2-27] [PMID: 18093345] ]. While research by Spinella-Jaegle et al showed that BMP-2 has a stimulating effect on osteocalcin expression in murine preosteoblastic cell line MC3T3 [37Spinella-Jaegle S, Roman-Roman S, Faucheu C, et al. Opposite effects of bone morphogenetic protein-2 and transforming growth factor-beta1 on osteoblast differentiation. Bone 2001; 29(4): 323-30. [http://dx.doi.org/10.1016/S8756-3282(01)00580-4] [PMID: 11595614] ]. In this study, there is an increase in osteocalcin expression at proximal and distal femur bones, as well as the appearance of osteocalcin expression in the middle femur bone in the treatment group with rrPDGF-BB compared with the control group. This can be explained because rrPDGF-BB indirectly influences the increased expression of osteocalcin, but increased VEGF and BMP-2 expression stimulates osteoblast cell formation from mesenchymal cells. The formed osteocalcin causes mineralization to the middle part of the femur, so that the bridging callus is formed until the middle of the femur bone, which is significantly different from the control group. PDGF BB significantly enhances the formation of new bone and bone mineralization, thus initiating the union process on femoral rat bone with large defects through increased expression of VEGF, BMP 2 and osteocalcin. Suroto H, Munthe RV. Chip freeze dried cancellous bone allograft as scaffold to fill small bone defect in long bone. J Orthop Traumatol Surabaya 2014; 3(1): 192-201. 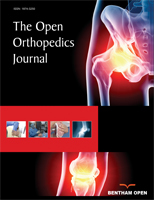 Shukla S, Malhotra R, Bhan S. Results of fresh frozen bone allografts in orthopaedics. Indian J Orthop 2003; 37(2): 8. Ferdiansyah , et al. Regenerasi pada massive bone defect dengan bovine hydroxyapatite sebagai Scaffold Mesenchymal Stem Cell. JBP 2011; 13(3): 179-95. Sanchez-Fernandez MA, Gallois A, Riedl T, Jurdic P, Hoflack B. Osteoclasts control osteoblast chemotaxis via PDGF-BB/PDGF receptor beta signaling. Heisenberg C-P, ed. PLoS ONE. 2008;3(10):e3537.